Do I Really Need a Lawyer to Handle My Personal Injury Case? If you ask a personal injury lawyer, they will almost universally tell you that you need a lawyer. Do you really? Probably, but it depends on the individual facts of the case. There is only one reason not to retain a lawyer: you do not want to pay the lawyer’s fees. It is a good reason. Because attorneys’ fees are often 33% of the total recovery and usually more if a lawsuit if filed, it can be a significant amount of money. Also, in spite of what many lawyers will tell you, there certainly are personal injury cases where the client would have been better served by not having a lawyer in the first place. First, before we talk about why you might not need a lawyer, let’s discuss why, in most cases, you are better off having a lawyer, even if your ultimate goal is to settle the case. There are number of reasons for this. First, an experienced personal injury lawyer can evaluate the offer for you so that you can know whether you are getting fair compensation. The insurance companies’ goal is not to mete out justice but to pay you as little as possible. Without knowledge of what the fair value of the case is, you are in the dark as to what the settlement and trial value is of cases similar to yours. Is $400,000 a fair value for your case? It sure is a lot of money. But is it what your case is worth? Unless, you have seen hundreds of these cases and have had the opportunity to take similar cases to a jury, you really have no idea if you are hitting a home run or if the insurance company is taking advantage of you. Insurance companies are more likely to settle your case for a bargain when you represent yourself, because they know you do not know the value of the case. Second, when you are not represented by an attorney, the insurance companies also know that you do not have a hammer in the event that your case does not settle. The leverage a personal injury lawyer has, particularly a lawyer who has a proven track record with the insurance companies, is that a lawsuit will be the response to an unreasonable offer. Make no mistake: Insurance companies know who the serious lawyers are who are willing to try cases; they also know which lawyers settle almost all of their cases. Your settlement offer typically reflects this. Our law firm has won tens of millions of dollars for victims by fighting every single case with zeal like it was the only case we have. Many of those victims were people who first tried to handle their case themselves and failed miserably, often damaging their case in the process. Can we help you? Call 800-553-8082 or get an online consultation. Third, more work often needs to be done to be able to put your personal injury case in the position to receive a reasonable offer. Many cases require additional work to prepare a demand package beyond the collection of the medical bills. You might need, just to name a few examples, an additional report from a doctor with respect to the scope of your injuries or future required medical care, an economist’s report to calculate your real damages, or a vocational rehabilitation expert to assist in determining your economic loss. A quality advocate can provide the expertise to figure out what you need and how to go about getting it. The fourth reason to hire an attorney is that a lawyer that is a skilled advocate and negotiator can often make a meaningful impact on your case. You need someone to explain why your case deserves more money than the insurance company thinks it is worth. The insurance companies are going to construe every fact where reasonable minds could differ against you, unless you have someone advocating your case. You might think you can advocate your own case to the insurance company. Who is more qualified than you to discuss your own injuries? In some ways, you will be able to advocate your own case better than anyone because you actually experienced the pain and suffering that you are discussing with the claims adjuster. The biggest problem with doing this is that you often say things that end up hurting your case when you handle your own claim. This leads to the final major problem with handling you own case: that you will screw it up. So many people handling their own personal injury cases miss a filing deadline, fail to understand all of their rights, or say something to the insurance company that they should not have said, and this gets used against them later. Okay, so it is clearly the safer play to hire a lawyer for any case. And this is not by any means a full laundry list of why hiring a lawyer is - generally speaking - the smartest thing to do. But if you loathe the idea of paying attorneys’ fees and don’t mind taking a risk of doing something to destroy or harm your case, there are some cases where there is less risk than others. The best cases to handle by yourself are soft tissue injury cases where the value of the case is less than $5,000. The reason for this is that the value of these car accident claims, if you are not interested in filing a lawsuit, is typically more static. The value a lawyer can add to your case increases exponentially with the degree of injury. The reason for this is that smaller cases, in most jurisdictions, are decided by judges where there are less likely to be the highs and lows you get with jury awards. If you ask 20 people what the value of a crushed ankle or a fractured leg for a 23 year-old girl who makes a living on her feet, you are going to get 20 different answers. This is where quality advocacy matters. If you ask 20 judges what the value of a soft tissue injury claim with a totaled vehicle, an emergency room visit and six weeks of physical therapy, the standard deviation from the average will be a small fraction of what it would be for the crushed ankle or fractured leg example. 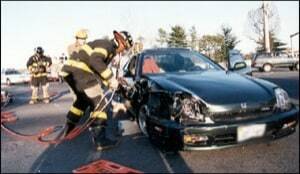 We would rather that you hire a lawyer to handle your personal injury case. But some people are going to ignore that advice. If instead you want to talk to an experience advocate, call us 800-553-8082 or get a free case evaluation online.